A beautiful combination of strawberry and apricots, with chocolatey undertones from the cacao butter. A deliciously healthy twist on an old favourite – Apricot delights! Apricot delights are a personal favourite of mine. As a kid they were the healthy treat I got in my school lunchbox. I was allowed to eat as many of these as I liked, because after all they were good for me…they’re just apricots, aren’t they? I was quite shocked when I bought a packet of apricot delights and found out that apricot delights aren’t just apricots after all. Let’s have a look at what they’re actually made from. Apricots 50%, Sugar, Glucose Syrup (Derived from Corn), Vegetable Oil, Acidity Regulator: (330), Emulsifier (Soya Lecithin), Corn Starch, Natural Colour: (160b), Natural Flavour, Preservative: (220). A lot of sugar and numbers in there. Not to mention the soy and vegetable oil! Dried apricots, strawberries (fresh/dried), dessicated coconut, cacao butter. Real fruit, no additives, preservatives or sugar. These apricot delights are yummy and just, well…..berry good for you! Because I know sometimes we can’t always get the ingredients that we need, forget to buy some of the ingredients (ahem); or I’ve just found a few toothsome alternatives that you might like to try! Again add an extra 1/2 cup of dessicated coconut. Want to go a little nuts? Add 1/2 of raw macadamias to the recipe. This tastes amazing but I wanted to keep the standard recipe allergy free. 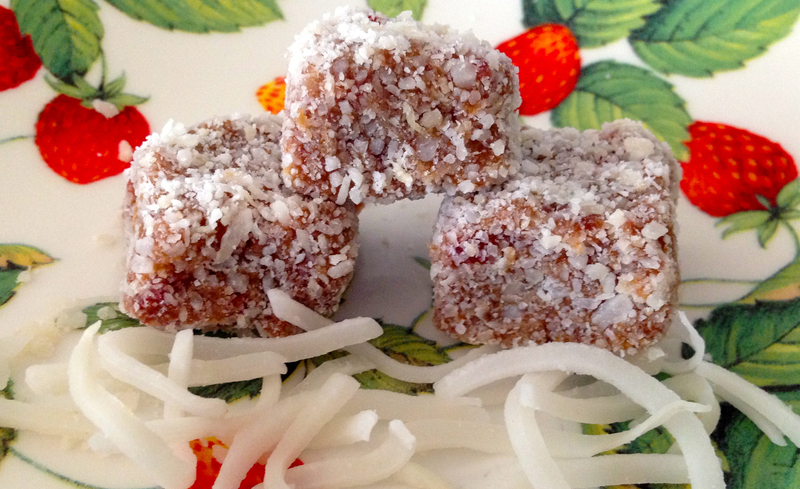 Extra desiccated coconut for coating finished strawberry and apricot delights. Roughly chop apricots and fresh strawberries. Place in saucepan and add water. Bring to a boil and then simmer for approximately 10mins until the mixture forms a soft paste. Leave to cool. 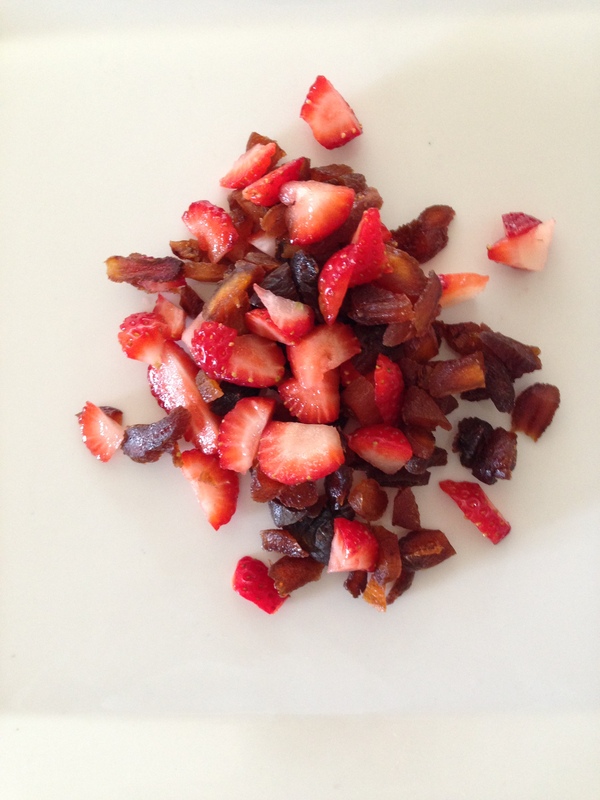 In a food processor, combine strawberry and apricot mixture with all other ingredient and blend until well combined. Line a baking dish (mine was approximately 23 by 18) with baking paper. Pour out mixture and spread evenly into baking dish. Cover and refrigerate for at least 4 hours or overnight to set. Once set turn the mixture out onto a board and cut into squares. Dust with extra desiccated coconut. Refrigerate. Thanks Johanna, so nice to get some feedback from someone with such a great food blog!